In third pAsuram – AzhwAr says due to emperumAn‘s sauseelyam (excellent disposition) and super-human activities such measuring the three worlds, he is the ISwara (controller). Subsequently, AzhwAr says emperumAn is the greatest of all. mAl thanil mikkum Or thEvum uLathE? Is there any one greater than the great (emperumAn) who keeps 1) rudhra who rides a bull, 2) brahmA who is seated in a lotus and 3) SrImahAlakshmi who is inseparable and seated on a lotus in his divine chest – all these three in his divine body to be worshipped by the residents of paramapadham (who know emperumAn’s excellent disposition towards all) and who measured the higher (celestial) world by running his feet over the earth, measuring it and accepting it? ERanai – Just like sarvESvaran is proud about him having garuda as his vehicle, rudhra is proud about having the bull as his vehicle (like a cowherd who would be proud about his cattle). 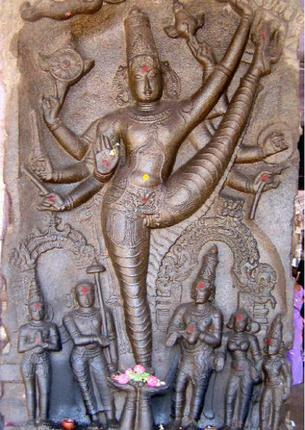 pUvanai – brahmA who is proud about his direct connection with bhagavAn. It is because of this direct birth in the lotus flower, he is called “aja”. pUmagaL thannai – one who is made of the fragrance of the lotus flower, who is the embodiment of sweetness (most enjoyable) and who has equal importance as bhagavAn himself as mentioned in thiruvAimozhi 10.10.6 “unakku ERkum” (who fits your stature). “thannai” after “pUmagaL” highlights her importance over others. While they are mentioned casually as “ERanai“, “pUvanai” – she is mentioned with great emphasis in “pUmagaL thannai“. viN thozha vERu inRith thannuL vaiththu – the residents of paramapadham worship emperumAn with great astonishment for his quality of accommodating rudhra, brahmA et al who are not firm in their devotion along with SrI mahAlakshmi who exist purely for emperumAn’s pleasure. nanjIyar asks bhattar “Does brahmA, rudhra et al hold on the emperumAn’s divine form always?” and bhattar replies “No, they are accommodated a place by emperumAn in his divine body during grave dangers. AzhwArs, holding on to such quality, always speak about it”. vERu inRi – As said in thiruvAimozhi 4.8.1 “kURALum thani udamban” (emperumAn who has a divine body where each one taking over a particular part and living there), handing over his divine body parts in proper order to others. viN thozha – As in “manjA: krOSanthi” (bed making noise means one lying on the bed making noise) – hear (spiritual) sky (paramapadham) worshipping means the residents of paramapadham worshipping. The residents of this material world are amazed with bhagavAn’s supremacy and the residents of the spiritual world are amazed with his simplicity. mEl thannai mIdhida nimirnthu maN koNda – mEl thanai – the higher worlds; As said in thirunedunthANdagam 5 “appAl mikku” (greater than the higher places), all parts of earth came under his stretched out lotus feet. mikkumOr thEvum uLathE – is there any one greater who exist? Even when emperumAn is mixing freely with all dhEvathAs, is there any one who can be compared with him? Should I declare SrIman nArAyaNan who touched everyone with his lotus feet as supreme or should I declare those who were touched on their head by that lotus feet as supreme? This entry was posted in thiruvAimozhi, thiruvAimozhi 2nd centum on January 13, 2016 by Sarathy Thothathri.